Cam, Lori and Don show off their CFUZ mugs at the market. On Saturday May 28th, Peach City Radio will have a table at the Farmers' Market. We won't just be spreading the message about community radio goodness, it will also be a training opportunity for those interested in making radio. Cam, a longtime programmer with Peach City Radio, will be training interested volunteers in interviewing techniques, how to use a field microphone, and he'll also have a laptop computer there so you can edit your audio. Editing your audio on site will give you quick feedback on your sound quality and interviewing technique so you can improve on the fly. The audio will be put together into episodes that will air on Peach City Radio. 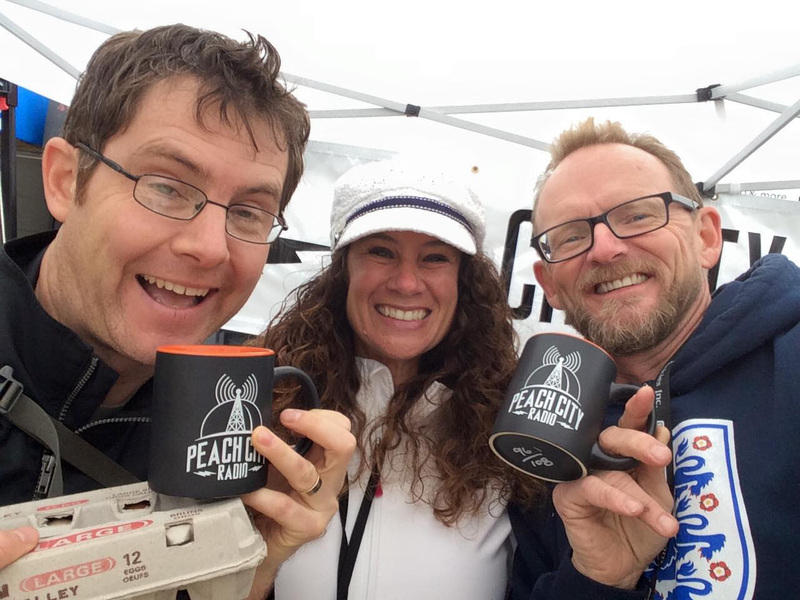 Cam did something similar at the final Farmers' Market of the season in 2015; the result was Peach City Requests which you can listen to here. Please contact our Volunteer Coordinator Claire if you are interested in participating in this radio making opportunity at the Market. The first shift goes from 7:30 - 10:30am and the last shift from 10:30am - 1:30pm. Hope to see you there!